It is August!!! Holy moley, time flies!! This week I am hosting the Gluten-free Menu Swap! I chose cherries as my featured ingredient. I adore cherries and have been eating them like crazy this summer. You can find great info on cherries on Wikipedia. I have used cherries in many different ways this year. I top my salads with them, I eat them in yogurt, I eat them in cereal, I eat them in ice cream, I eat them straight out of the bag. Last week I had planned on making a cherry cake, but ended up making Blueberry Chia Muffins instead because I had blueberries that needed to be used up. 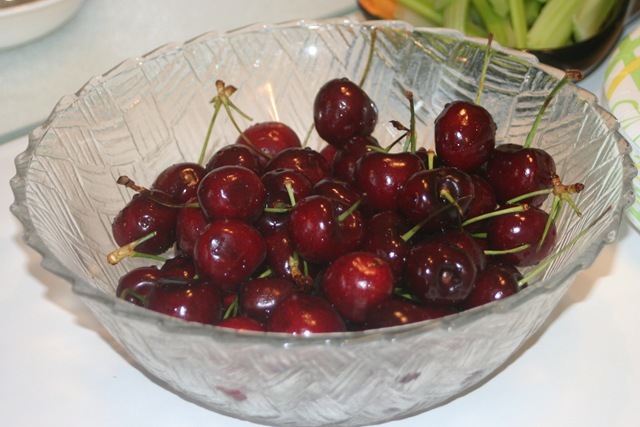 What is your favorite way to eat or use cherries? This week is Hannah’s birthday! She will be 7 on Thursday!! Again, time flies!! We had a family cookout yesterday for her and she will have a small party for her friends from school this coming weekend. Talk about a full week of b-day fun! Monday ~ Barbeque chicken breasts, Garlic Rosemary Roasted Potatoes, broccoli & salad. Wednesday ~ Grilled Salmon, grilled asparagus & sweet potatoes, grilled pineapple & salad. Cherry Cake for dessert. Thursday ~ Herb Roasted Pork Tenderloin, mashed potatoes, fresh green beans & salad. Friday ~ Pizza night! Bob’s Red Mill veggie for me, pepperoni for the family & salad. Saturday~ Leftovers or breakfast for dinner. Heather at Celiac Family has a great looking menu this week! I can’t wait to hear how the pizza crust goes on Monday, I have that cookbook, too!! Please make sure to let us know! Sea at Book of Yum always makes me drool with her recipes & pictures. She has a great recipe up on her post for Garam Masala Indian Tofu Scramble. She also has Chebe grilled pizza on her menu for Friday. YUM!! Wendy at Celiacs in the House has lots of amazing produce from the farmer’s market! Look at all of those tomatoes! I can’t wait to hear more about the homemade cherry ice cream she is making this week! Linda at The Gluten-free Homemaker has a great looking menu! I am interested in the Easy Rice salad!! 🙂 YUM! Amanda at Asparagus Thin has a mouth-watering menu planned for the week! Raspberry polenta pie? Sweet Chili Pumpkin Salad with Pistachio Crisps? I might be moving in!! JoAnn at My Experiment in Gluten-free Living has a great menu! Lots of fun crockpot meals! I love cooking with my crockpot! I am bookmarking these recipes! Anyone who wants to participate in the Gluten-Free Menu Swap, please email me at: kbouldin@insight.rr.com and I will edit this post with your link.